Start your ArtPrize adventure at our new Visitor Pavilion, located at Rosa Parks Circle, where a friendly volunteer can make sure you're ready to vote for your favorite entries, help you map your unique ArtPrize route, equip you with one of our three Experience Guides (including the Family, Outdoor Art and Critics' Choice Experience Guides!) and a Metro Pass, give you your free ArtPrize Event Guide and help you make the most of your ArtPrize experience. ArtPrize 101 (English) from ArtPrize on Vimeo. Art is meant to be experienced, but it’s also fun to make! Unleash your creative spirit with these free activities and resources designed for artists of all ages. Located at the Visitor Pavilion at Rosa Parks Circle, this creative space offers fun STEAM activities for all ages. 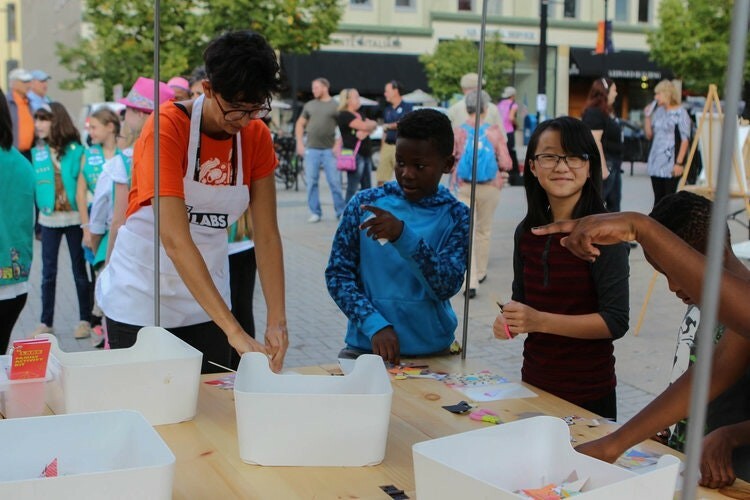 Join ArtPrize and our program partners for fun hands-on activities at the Visitor Pavilion located at Rosa Parks Circle. STEAM Lab in collaboration with The Air Zoo and FIRST Robotics. Sculpture Lab in collaboration with Frederik Meijer Gardens & Sculpture Park. Chair Camp in collaboration with Grand Rapids Public Museum. Check out these fun pop-up workshops to collect a series of postcards by completing art-based challenges. Each card celebrates a past ArtPrize winning entry and includes a creative challenge based on the work of art. Find more events for families online at artprize.org/events and on our free mobile app. ArtPrize Labs sponsored by Grand Valley State University, Herman Miller Cares and Switch. STEAM Lab & Mobile STEAM Lab powered by Switch. Mobile Workshop sponsored by Herman Miller Cares. Take a moment to pause and experience the work of art. What do you see or hear? What is happening? Why is it the way that it is? The artist statement can help with this. How does it relate to your own life, feelings, ideas? Does it challenge you? Does this artwork make you want to make your own artwork? Is it exciting? Vote—do you think it should win ArtPrize? Why? 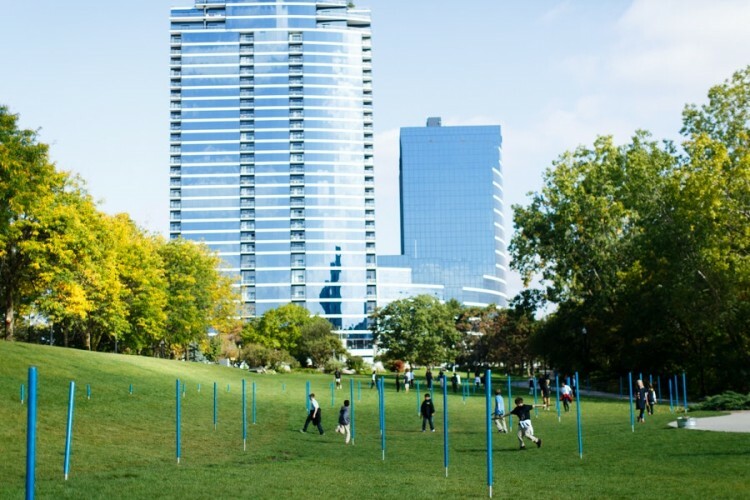 At ArtPrize, your voice counts! If you're 13 or older, you can cast votes in support of your favorite artworks. And for the second year in a row, you can vote for artwork created by youth collaboratives. The entries eligible for the Youth Collaboration Award, sponsored by the Western Michigan University, are marked on the Family Experience Guide map. Vote using the ArtPrize mobile app — free for iOS and Android — or visit the ArtPrize Visitor Pavilion at Rosa Parks Circle to sign up.